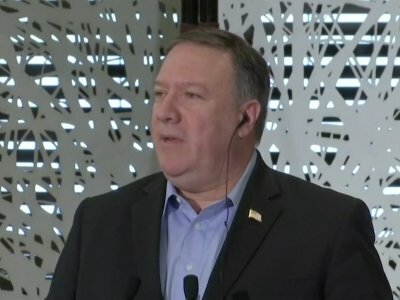 HANOI, Vietnam (AP) — Undeterred by a blistering rebuke of his efforts to forge a denuclearization deal with North Korea, U.S. Secretary of State Mike Pompeo on Sunday appealed for North Korea’s leadership to follow Vietnam’s path in overcoming past hostilities with the United States. Pompeo called on North Korean leader Kim Jong Un to replicate Vietnam’s “miracle” of economic growth by improving ties with the U.S., vowing that America keeps its promises with former foes. Speaking to members of the U.S.-Vietnamese business community in Hanoi, Pompeo said Vietnam’s experience since the normalization of relations with the U.S. in 1995 should be proof for North Korea that prosperity and partnership with the U.S. is possible after decades of conflict and mistrust. “We know it is a real possibility because we see how Vietnam has traveled this remarkable path,” Pompeo said. “In light of the once-unimaginable prosperity and partnership we have with Vietnam today, I have a message for Chairman Kim Jong Un: President Trump believes your country can replicate this path,” he said, repeating President Donald Trump’s pledge to help improve North Korea’s economy and provide it with security assurances in return for Kim giving up nuclear weapons. The comments came after Pompeo had earlier Sunday in Tokyo brushed aside North Korea’s accusation that the U.S. was making “gangster-like” denuclearization demands of the North. He maintained that his third visit to North Korea on Friday and Saturday had produced results. But he also vowed that sanctions would remain until Pyongyang follows through on Kim’s pledge to get rid of his atomic weapons. Pompeo downplayed a harshly critical North Korean statement issued after the talks in which the country’s foreign ministry bashed hopes for a quick deal and attacked the U.S. for making unreasonable and extortionate demands aimed at forcing it to abandon nuclear weapons. The statement was sure to fuel growing skepticism in the U.S. and elsewhere over how serious Kim is about giving up his nuclear arsenal. Those include the formation of a working group to determine exactly how North Korea’s denuclearization will be verified and a Thursday meeting with Pentagon officials to discuss the return of remains of American soldiers killed during the Korean War. South Korean Foreign Minister Kang Kyung-wha said that North Korea had balked at a written pledge for “complete, verifiable and irreversible denuclearization” for historical reasons but stressed that the goal remained the same whether that exact phrase was used. Fully verified, final denuclearization “isn’t any softer in stating our shared goal of complete denuclearization,” she said. After Trump’s historic summit with Kim in Singapore last month, the president declared the North was no longer a threat and would hand over the remains of American soldiers. Yet three weeks later, the two sides were still divided on all the issues, including exactly what denuclearization means and how it might be verified. The promised remains have yet to be delivered.